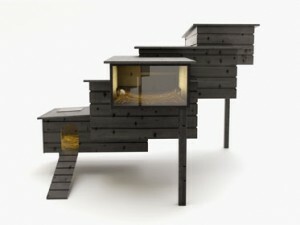 Julia Janzen , Archive » Totally Cool Chicken Coop! Designer Frederik Roijé's "Breed Retreat"
Frederik Roijé should definitely get some type of award, if he hasn’t already for designing one of the coolest chicken coops I’ve ever seen! I’m not an expert of raising chickens and I’m not sure it’s function is as good as it’s design but I just have to say how impressed I am by his ingenuity and design aesthetics. Now if only our community hadn’t passed a no backyard chicken ordinance. Thanks for the tip! I’m keeping it in reserve for when the squirrels discover our garden.